The Renault Kwid achieved a total score of 24.68 points in which it is rated as Zero-Star. The Kwids scored 10.12 points for AOP, 14.56 points for COP but no point is given for SATs category. 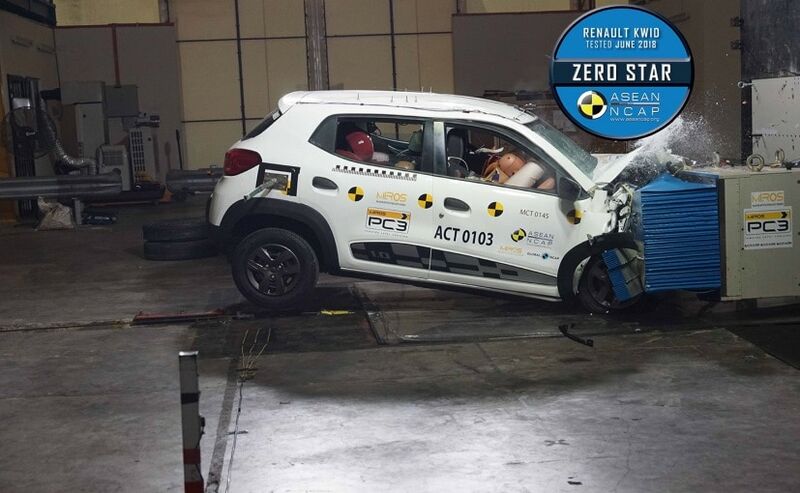 India-made Renault Kwid sold in Indonesia has scored a Zero Star safety rating in a recently conducted crash test by the New Car Assessment Program for Southeast Asian Countries a.k.a. ASEAN NCAP. The Renault Kwid achieved a total score of 24.68 points in which it is rated as Zero-Star. The Kwid's score can be broken down into 10.12 points for adult occupant protection (AOP) category, and 14.56 points for child occupant protection (COP) category. However, considering the fact that the model was not equipped with any safety assist technologies like - ABS, ESC, seatbelt reminders, and more, ASEAN NCAP did not get any score for SATs category. ASEAN NCAP Secretary-General, Khairil Anwar Abu Kassim said, "We are truly disappointed to find that there are still cars out there that do not offer high degree of safety levels to its occupants in the ASEAN region. What is more disappointing is that these cars are sold in countries that recorded one of the highest numbers of road fatalities; in which WHO published Thailand with 14,059 fatalities while Indonesia had 26,416 number of road fatalities." In terms of safety equipment, Renault Kwid tested by the ASEAN NCAP featured a driver's side airbag and pretensioners and load limiter for the driver-side seatbelt alone. Commenting on the Renault Kwid's poor performance and lack of safety features, David Ward, Secretary-General, Global NCAP, said, "It's very disturbing to see such a poor result for the Kwid. Renault has shown that they can make a much safer version in Latin America, so why not in South East Asia too? Different regions and double standards from Renault is deeply disappointing!" Earlier in May 2016 the India-made car also scored zero stars safety rating in the crash test conducted by the Global NCAP. Post that Renault made some safety updates to the Kwid, which garnered it a 1-star rating in a second crash test that was conducted in September 2016. The India-spec model too gets only driver's side airbag and pretensioners and load limiter, but unlike the Indonesia spec model, the come as an optional feature on the top-spec model.